The history of River East Art Center begins with the history of River East, the city’s most spectacular lakefront neighborhood. In recent years MCL Companies has created the largest, and undoubtedly most ambitious, mixed-use urban development in the country... 13 acres bounded by the Chicago River, Grand Avenue, Columbus Drive and Lake Shore Drive... a neighborhood bridging North Michigan Avenue and Navy Pier with major hotels, dozens of restaurants, retailers, recreational opportunities and up to 2,500 residences. 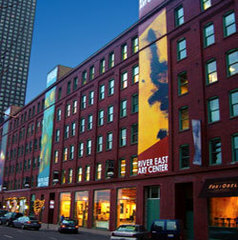 The Mission of River East Art Center can best be expressed by the Mandala, the universal, ancient diagram River East Art Center has adopted as its logo. (One such Mandala is pictured here. However, the Mandala can take on infinite forms.) The Mandala is symbolic of individuals coming together to create something larger then themselves, while maintaining personal uniqueness.